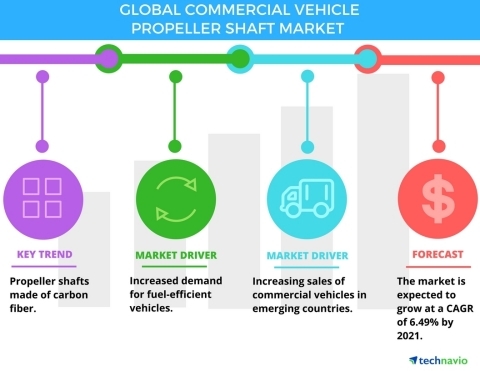 Technavio analysts forecast the global commercial vehicle propeller shaft market to reach 17.34 million units during the forecast period, according to their latest report. The research study covers the present scenario and growth prospects of the global Commercial Vehicle Propeller Shaft Market for 2017-2021. The report further segments the market based on application (LCV and M&HCV), and geography (the Americas, APAC, and EMEA). The market will have a linear relationship with the total sales of commercial vehicles (including LCVs and M&HCVs). The global commercial vehicle propeller shaft market is a derived market; hence, its growth or decline depends on the number of vehicles sold. The type of the propeller shaft to be equipped is determined after considering the overall length of the commercial vehicle. India and China, being the main manufacturing hubs in the world, must deal with enormous amounts of goods that have to be transported to various locations like ports and warehouses. Moreover, the manufacturing process involves the transportation of copious amounts of heavy raw materials from a place of procurement to the place of manufacture. This is where commercial vehicles come into use. With the rise in global urbanization, there is a significant rise in the construction activities, leading to increased consumption rates within urban and semi-urban areas. Fluctuating prices of fuel and slow growth in the number of freight orders has led the buyers of commercial vehicles to look for vehicles that offer higher fuel efficiency. The introduction of lightweight propeller shafts in commercial vehicles provides them with 10% more fuel efficiency than the vehicles with heavy propeller shafts. “Fuel prices have been increasing all over the world at a very rapid pace. The average diesel price is expected to reach USD 0.98 by 2017. There is a considerable decrease in the profits of freight operators due to the increasing fuel prices and a decline in freight transport volumes. The Organization of the Petroleum Exporting Countries is planning to limit the production of petroleum, which will make non-OPEC members increase the prices of fuel. These factors will increase the demand for fuel-efficient vehicles,” adds Siddharth. Rising vehicular pollutions are inducing governing bodies of various countries to update their vehicular emissions norms at intervals less than a year. With the introduction of fuel efficiency standards, OEMs will be encouraged to increase the mileage of vehicles. This will increase the sale of propeller shafts. Also, the Implementation of regulations to maintain standards for fuel economy will decrease the dependency on petroleum-based fuels. Become a Technavio Insights member and access all three of these reports for a fraction of their original cost. As a Technavio Insights member, you will have immediate access to new reports as they’re published in addition to all 6,000+ existing reports covering segments like automotive electronics, automotive manufacturing, and wheels and tires. This subscription nets you thousands in savings, while staying connected to Technavio’s constant transforming research library, helping you make informed business decisions more efficiently.